From ice adventures, getting out to an ice fishing hot spot using e-fat bikes can extend the winter fishing season or other shoulder season outdoor activities. These are topics the “godfather of ice-fishing,” Minnesota native, Dave Genz will cover at the E-Bike Challenge Minneapolis, this weekend. If the idea of using an electric bike or electric fat bike, called an e-bike had piqued your interest, you are in luck. Coming to Minneapolis, the E-bike Challenge is March 23–24, 2019. On Saturday, March 22nd, at 2 p.m. Dave will be on stage with John Schaubach, from Crosby, MN. The two of them will share their story using e-fat bikes, in the True North. Covering the adventures of John’s winter fat biking experience up near Cuyuna that led to the eventual use of a pedal assist fat bike for ice fishing. At their Saturday presentation, learn from Dave how by using an e-bike he has discovered many advantages for ice fishing, with the motorized fat bike. Like his intro video, demonstrates, the pulling power of an e-fat bike makes it easier to haul sporting gear in off-road terrain situations. So, during early winter or late in the season when the ice isn’t thick or safe enough for an ATV or truck, Mr. Ice Fishing got to thinking. There has got to be a better way to reach distant hotspots with his lightweight, portable shelter and other gear? And the electric assist fat bike solved his problem which he will share. Recently Dave and John completed a side-by-side comparison of a traditional fat bike to a pedal assist fat bike. On stage, this coming Saturday they will share their findings, many fun stories of adventure and successes. Mark your calendar and page through the pre-event E-bike Challenge Guide to prepare your questions when looking at the latest e-bike models. Then, get a feel for the bike or bikes you like the best at the Challenge’s indoor test track. 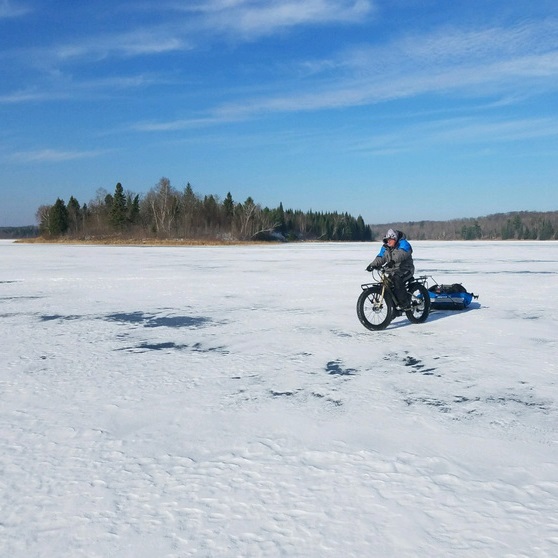 This entry was posted in News and tagged Clam Outdoors Fish Trap, Cuyuna Country, Dave Gentz, E bike Challenge, e-Fat Bikes, Godfather if ice fishing, John Schaubach, Mr Ice Fishing, Rambo Fat Tire Bike on March 17, 2019 by Russ Lowthian.